Kilimanjaro is the highest free standing mountain in the world and regarded as the highest mountain conquerable by someone with no formal training or experience in climbing. Children as young as 12 have made it to the highest point, Uhuru Peak (19,341 feet) and about 65 percent of the 35,000 hikers attempting the mountain annually make it to the top. Summiting Kilimanjaro, however, is not a venture to take lightly. The journey entails at least five days of near constant walking, weathering wind, ice, heat and a rapid change in altitude. A certain degree of fitness and the go-ahead from a doctor are strongly recommended before attempting this arduous, though ultimately rewarding, task. The climb in itself is not only a physical experience but an adventurous journey. You will have to brave Kilimanjaro's five ecological zones on your route to the top. First is the cultivated farmland, the slightly populated mountainside grazing area where locals herd their livestock. The second zone is the rich rainforest area, which boasts scenic rapids, assorted exotic greenery and monkeys by the dozen. Leopard, civet cats and several antelope might also be spotted if you keep your eyes open. In the third zone, the moors, you will encounter less wildlife but an abundance of odd low-lying vegetation, some of which is endemic to the mountain. The next zone, the alpine desert, is nearly pure desert with sub-zero temperatures at night and sweltering heat by day. These extreme fluctuations are represented in the presence of both rocky and icy fields within the same plain. Finally comes the summit itself, where the ascent becomes as steep as it gets and the oxygen supply is half what it was at sea level. The views from the top, however, are among the best Africa has to offer. There are six routes to the top of Kilimanjaro, not all of which end on Uhuru, and potential climbers should carefully consider their preferences before deciding on the trip. 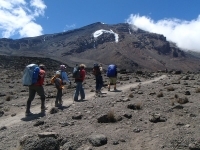 Several tour operators work on the mountain and they will map your route, guide you and carry your luggage - so compare prices and routes carefully before booking your Kilimanjaro experience.